A Spring Hill man was killed last week after a car struck him while he was riding his bicycle. The 54-year-old man was riding east on Portillo Road just before 11 p.m. when he crossed Mariner Boulevard and was hit by a 2010 Chevy Aveo, according to the Florida Highway Patrol. The Aveo collided with the man, ejecting him from his bicycle and onto the road. The man died instantly from his injuries at the scene of the crash. All motorists should take extra care and precaution when driving in areas frequented by pedestrians and those on bicycles. Bicycle travel has increased during this down economy and we are all well served to be on alert when driving in the evenings. Sadly, bicycle accidents regularly occur in Hernando County because automobile drivers are not vigilant when it comes to maintaining a lookout for cyclists. These unfortunate accidents occur despite the fact that many safety precautions are taken by cyclists when riding. 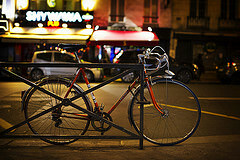 When it comes to accidents between a bicycle and automobile, the bicycle usually loses the battle. These catastrophic collisions are all too common on our roadways. The investigation of these accidents is further complicated by law enforcement and the general public’s bias against cyclists. After a bicycle accident with an automobile, the insurance company for the vehicle will begin an investigation into the accident right away. The insurance company will undoubtedly try to limit the recovery of the injured bicyclist to the lowest possible amount. Likewise, insurance companies have developed very specific procedures on handling bicycle accident claims, especially in the early stages of the claim. Therefore, it is important to have an injury attorney who will aggressively fight insurance companies who are unwilling to settle your claim for a fair value. A Hernando County Injury Lawyer at Whittel & Melton can help you obtain just compensation for your accident injuries and damages. If you wish to discuss your accident claim with a Hernando County Injury Attorney at Whittel & Melton without any charge or obligation, please call us today at 352-666-2121 or contact us online.